Governor Kelly vetoed the tax windfall bill, raising Kansans’ income taxes to the tune of $50 million. Near the same time, the latest state tax report shows Kansans decreasing shopping by $40 million. Is this just a coincidence, or are Kansans preparing to pay for higher taxes again? It’s possible Kansas’s fiscal troubles and sluggish growth led to Kansans preparing for more uncertainty in their finances. Here are the facts. In order to prevent a state tax increase from federal tax reform , the legislature attempted to pass SB 22. Like seeing someone mistakenly drop their wallet, passing SB 22 was the equivalent to returning the wallet to its owner. Ultimately, SB 22 was vetoed and the “wallet” is now in possession of the Kansas government. To better understand how the tax windfall affects you, look at your Schedule A on your 2017 federal return. Find the deductions of property tax, mortgage interest payments, expenses for medical care and gifts to charity. If the sum of those deductions are over $15,000 ($7,500 if single) on your 2017 return, but you took the higher federal standard deduction on your 2018 federal return ($24,000 if married or $12,000 if single), then your Kansas taxes likely went up…again. 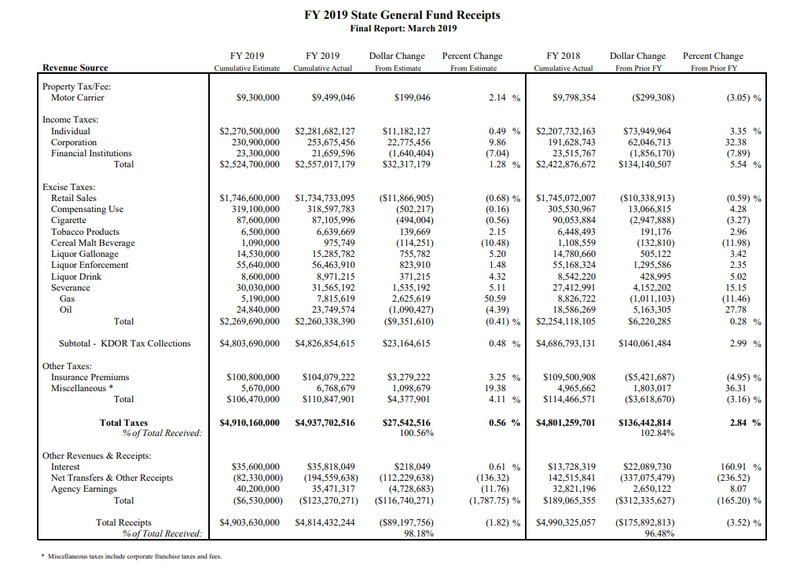 The March State General Fund Receipts suggests Kansans are dealing with those higher taxes and shrinking finances. Yes, it is true that total taxes to Kansas government are up $136 million over the same time last year. However, nearly all of it comes from higher individual income and corporate income taxes, both tied to the federal tax windfall. Take this in contrast with sales (and use) tax which didn’t see a rate increase yet hasn’t grown at all. The Kansas government has more money – via the found wallet. However, the original owner, working Kansas taxpayers, has fewer dollars to spend on food, clothing, and general goods and services. Unfortunately, adjusting for price changes over the year makes Kansans’ financial situation worse. Though the change in sales tax, according to this report, is close to 0%, prices, which are not noted, increased. The Bureau of Labor Statistics reports consumer prices from the first 9 months of fiscal year 2019 grew 1.7%. This means to purchase the same amount of goods as last year, Kansans need to spend 1.7% more dollars this year. In other words, sales tax must 1.7% higher, a change of $40 million. 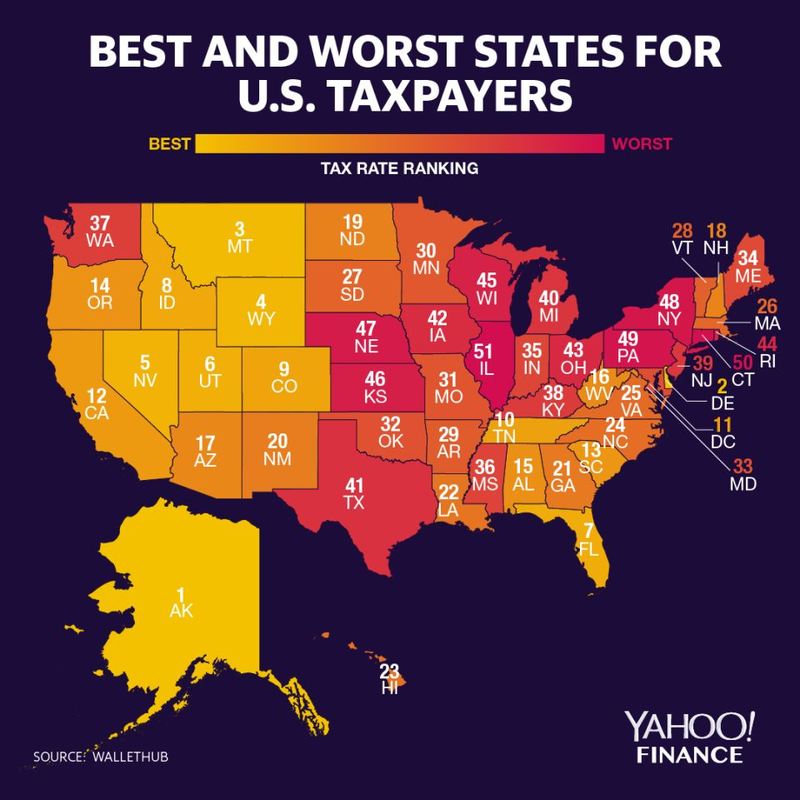 Perhaps this tepid spending stems from the fact Kansas’s high income, sales, property and excise taxes make it the 5th worst state for U.S. taxpayers. Wallethub compared state and local tax rates in all 50 states and the District of Columbia. Researchers found Kansas’s effective tax rate on U.S. median income is the 5th highest tax burden on Americans. Data points and third-party studies are painting a consistent picture of the plight of Kansas families. Kansans approach to the near constant creep of state taxes may be to pull back spending. On the contrary, Kansas government spends more than $2 billion above inflation, emptying its reserves in a few short years. The state’s high sales , property and excise tax, combined with record-setting income tax hikes are taking a heavy toll on Kansans. Their well-being relative to the rest of the country is suffering. Some argue high taxes and spending are needed to have effective government programs. This is not true, as spending more money is no guarantee of substantially better outcomes. In addition, we must remember there is a setback to constant tax increases. As Margaret Thatcher famously quipped, government eventually runs out of people’s money to spend.